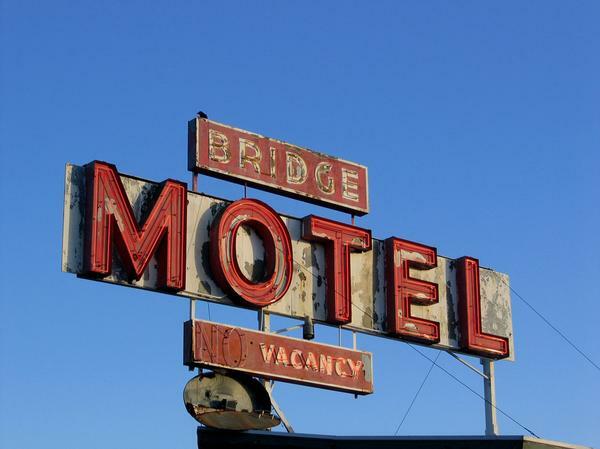 The Bridge Motel (3650 Bridge Way N, off Aurora, in Fremont) will host a one-night only event to kick off the MOTEL series on 15 September 2007, 5 PM - midnight. Built in 1952 by a retired policeman, the motel has anchored the north end of the infamous Aurora Bridge for decades in welcoming glory. Originally a place frequented by tourists and traveling salesmen, the Bridge Motel has over time become more a place for those living from paycheck to paycheck, and whose lives involve drug use, prostitution, and the like. In the popular imagination, the place embodies and realizes that underbelly, shady side of life's toiling. There has been murders here, and numerous drug busts, its decaying artifice contains the stories of a full lifetime of drama, and the day by day passing through of souls... For one night, its last night of existence, the Bridge Motel will be dressed up and called to shine and dance ... Numerous installation/performance artists have been given full rein the week prior, to transform each dilapidated pocket into whatever they could imagine. The opening evening will reveal the Bridge's final blossom before its inevitable razing. And to top it off, every inch of the motel will be crawling with performance artists, injecting the animation and energy of truly ephemeral art. The stellar roster of artists involved is sure to create a cacophony of sights and sounds to inspire the mind and heart, and give the aging motel a proper dress-up before it's demise ... This night is not to be missed.